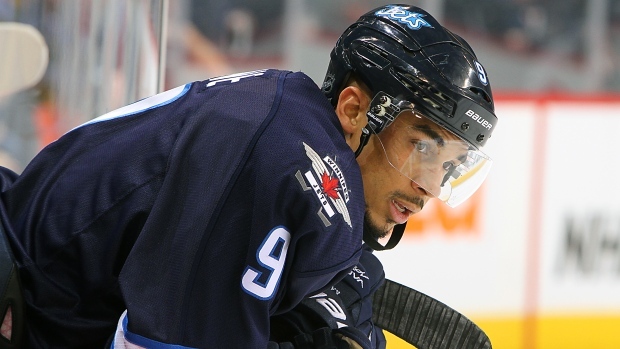 Evander Kane's tenure in Winnipeg has come to an end as the Jets dealt the winger to the Buffalo Sabres on Wednesday in an eight-player blockbuster trade. The Jets sent Kane, Zach Bogosian and unsigned goaltending prospect Jason Kasdorf to Buffalo for Tyler Myers, Drew Stafford, prospects Brendan Lemieux and Joel Armia and a 2015 first-round draft pick. The first-round pick going to Winnipeg will be the lowest of the three that Buffalo currently owns. In addition to their own choice, which could end up being the first overall, the Sabres have first-round picks from the St. Louis Blues and New York Islanders that were acquired last season. According to TSN Hockey Insider Pierre LeBrun, the Vancouver Canucks were also talking trade with the Jets on Tuesday night, but Jets called the Canucks Wednesday morning to say they were pursuing a bigger deal with another team. Kane expressed his excitement to LeBrun Thursday in an interview for his ESPN.com column. "Just looking at next year, they’re going to get a top pick and that’s exciting," Kane told LeBrun. "Just to have one of those two guys [Connor McDavid and Jack Eichel] maybe to play with next year, plus the other young players on that team." "It’s nice to go somewhere where you feel wanted and you feel that they want to put you in a situation to have success." ESPN's Craig Custance adds that the Sabres will retain half of Stafford's salary, which is $4 million for this season. He is eligible to become an unrestricted free agent this summer. "I'm excited about what this trade brings to our organization," said Jets general manager Kevin Cheveldayoff at a news conference. "At the end of the day it is a big deal but we think it's something that's going to help us both in the short-term and really help us in the long-term. "I feel good with the now but I'm really excited about the prospects of the future in this whole deal." Sabres general manager Tim Murray told the team's website that he was pleased with the results of the deal. "I'm happy. I believe in these players. I think they make us a better organization and a better team...these guys are hard to get," said Murray. Kane, 23, won't be able to play for the Sabres until the fall after having season-ending shoulder surgery earlier in the week. His expected recovery time is 4-6 months. The Vancouver native had 10 goals and 12 assists in 37 games this season for the Jets. He has three years remaining on a six-year deal that carries an average annual value of $5.25 million. Kane took to Twitter on Wednesday to offer thanks for his time in Winnipeg, writing: "Thanks to the people of the (Jets) organization and to the fans that have supported me through my 4 years there." Bogosian, 24, is playing his seventh NHL campaign and has three goals and 10 assists for the Jets this season. He has five years remaining on a seven-year deal worth an average annual value of $5.143 million. Myers, 25, was Buffalo's first-round pick (12th overall) in the 2008 NHL Entry Draft and has four goals and nine assists in 47 games this year. There are four seasons left on the seven-year deal he signed with the Sabres worth an average annual value of $5.5 million. Winner of the 2009-10 Calder Memorial Trophy as Rookie of the Year, Myers has spent his entire NHL career to-date with the Sabres. He has scored 45 goals and 106 assists in 365 career games with Buffalo. Stafford, 29, has nine goals and 15 assists is 50 games this year. He has played his entire nine-year career in Buffalo after being a first-round pick of the Sabres in 2004. Armia has been playing this season for the AHL Rochester Americans. He was selected 16th overall by the Sabres at the 2011 NHL Draft. Lemieux is playing for the OHL's Barrie Colts and was taken in the second round (31st overall) of the 2014 NHL Draft. He is the son of long-time NHLer Claude Lemieux. Kasdorf, 22, was selected by the Jets in the sixth round of the 2011 NHL Draft. He is currently playing for RPI of the NCAA. Kane departs Winnipeg after a turbulent couple of weeks. TSN Radio 1290's Gary Lawless of The Winnipeg Free Press initially reported that Kane was scratched in his hometown of Vancouver for the Jets' Feb. 3 game against the Canucks because he broke the team's dress code by wearing a track suit instead of a suit to a team meeting. It was later reported that Kane had a run-in with teammates the day of the Vancouver game that included Dustin Byfuglien throwing Kane's track suit into the shower and that Kane was not on the team bus to the arena for the game. The Sabres' new winger alluded to deeper issues, though, in his interview with LeBrun. "There’s definitely a lot more to it than some of the funny story lines that came out," Kane told LeBrun. "Sometimes you have to just let a story die and I guess that’s what we’ll do. But it was definitely disappointing with how everything shook out and some of the information was misconstrued, misleading, some of the facts kind of came out wrong or didn’t come out at all. That’s to be expected." "I’m definitely glad to be moving on and I’m going to have a fresh start with a new team. I’m looking forward to the future for sure." Kane was chosen fourth overall by the then-Atlanta Thrashers in the 2009 NHL Entry Draft. He enjoyed a breakout season in 2011-12, scoring 30 goals and adding 27 assists. However, he has broken neither the 20-goal nor the 65-game plateau in any season since. He missed two extended stretches this season - eight games in October with a knee injury and five games around the New Year with a lower body injury - before the shoulder surgery ended his campaign.